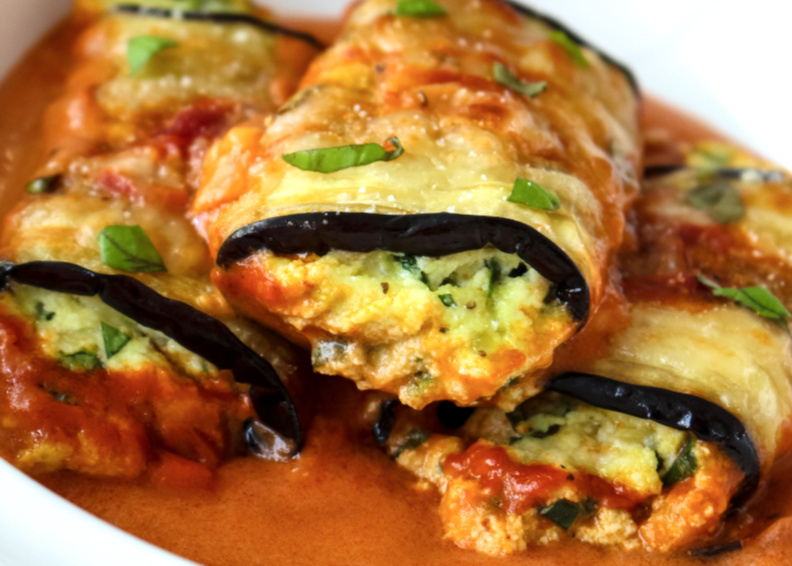 Eggplant Rollatini Rosa is a meatless dinner that features cheese and spinach stuffed eggplant baked in a creamy mixed Rosa Sauce. It is the perfect dinner recipe for your next special occasion! Eggplant is one of my very favorite special occasion foods. Eggplant dishes have a simple elegance to them, and, lucky for me, my husband and I both adore eggplant. That makes it perfect for a date night at home! Eggplant Parmesan is always popular when it comes to eggplant dishes, but it’s awfully predictable, don't you think? When I really want to step up my eggplant game and transform my eggplant into a meal that’s truly extra special, I make my eggplant rollatini! Hello, Valentine’s Day dinner idea! 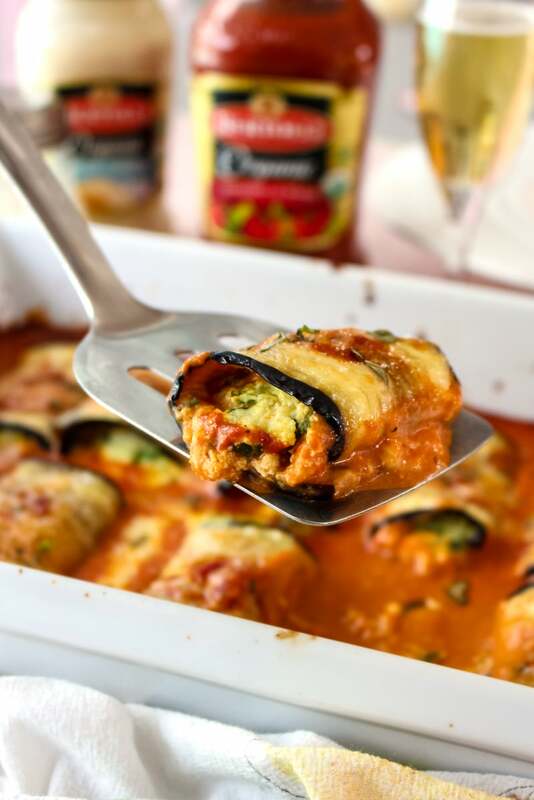 These gorgeous little eggplant rollatini would be the perfect romantic dinner for your Valentine’s Day date night at home. You can tell just by looking at them that every little rollatini was made with love. 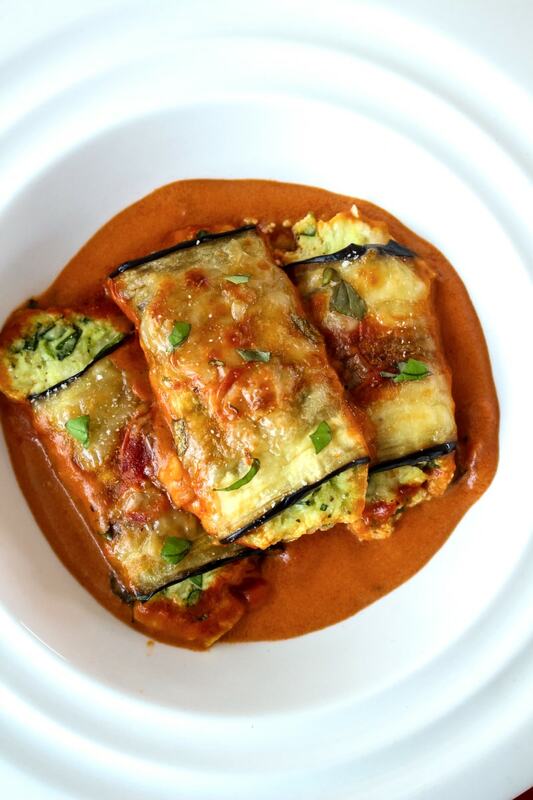 This eggplant rollatini isn't difficult to make, as a matter of fact, it's quite easy! However, each step does take a little bit of time to prepare. Be sure to plan ahead so that you have enough time to complete all of the steps. You don't want to spend your whole date night in the kitchen, right? Before the eggplant is baked, it is salted to help draw out the bitterness. I know some people skip this step, but I always salt my eggplant. After the salting, the eggplant needs to bake until it is pliable enough to wrap around the cheese filling. Finally, you will need to make the Rosa Sauce that ties it all together. The Rosa Sauce is what makes this recipe really stand out! What is a Rosa sauce, you might ask? This beautiful Rosa sauce is so easy to make! By simply combining two kinds of organic sauce, Bertolli® Organic Traditional Tomato & Basil Sauce and Bertolli® Organic Creamy Alfredo Sauce, you can make a mixed Rosa Sauce is full of rich, authentic flavor. I LOVE it! Bertolli® Organic Traditional Tomato & Basil Sauce and Bertolli® Organic Creamy Alfredo Sauce are some of my favorite Italian Pasta Sauces. They are made with USDA Organic, non-GMO ingredients like plump tomatoes and extra virgin olive oil in the Bertolli® Organic Traditional Tomato & Basil Sauce and fresh cream, real butter, and aged cheese in the Bertolli® Organic Creamy Alfredo Sauce. When I bake the eggplant for this dish, I opt to bake without breading, and I add some spinach to the cheesy filling. In my opinion, a lighter baked Italian dish on Valentine’s Day makes more sense than something fried and heavy. I added the spinach to give the rollatini a little pop of color and a little nutritious boost. 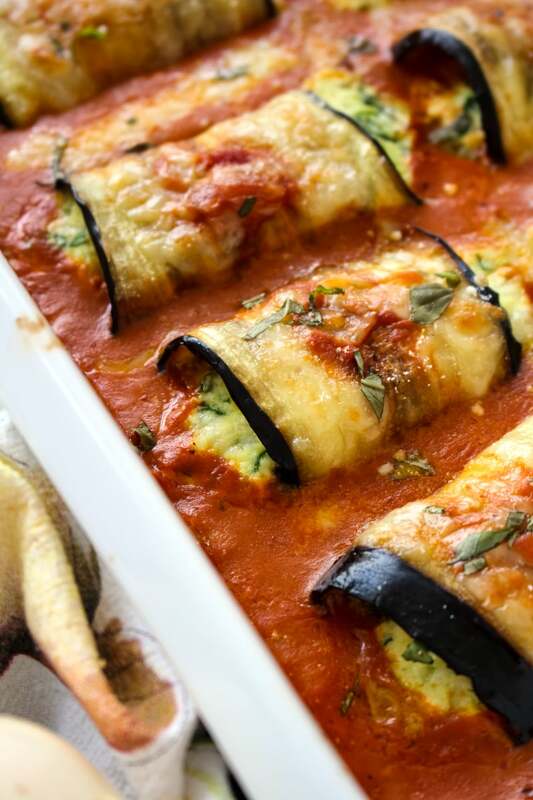 The combination of tender eggplant, cheesy filling, and fresh spinach is so delicious. Add that Rosa Sauce to the mix and, well, you already know how much I love that Rosa Sauce. It's the icing on the eggplant cake! If you have been looking for the perfect meal to cook for your honey on Valentine’s Day (or any special occasion!) 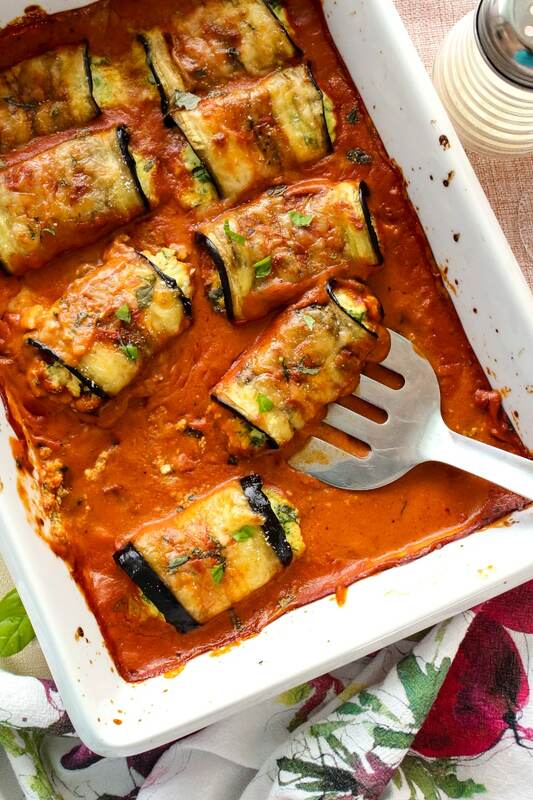 this Eggplant Rollatini Rosa made with Bertolli® Organic Traditional Tomato & Basil Sauce and Bertolli® Organic Creamy Alfredo Sauce is an excellent choice. 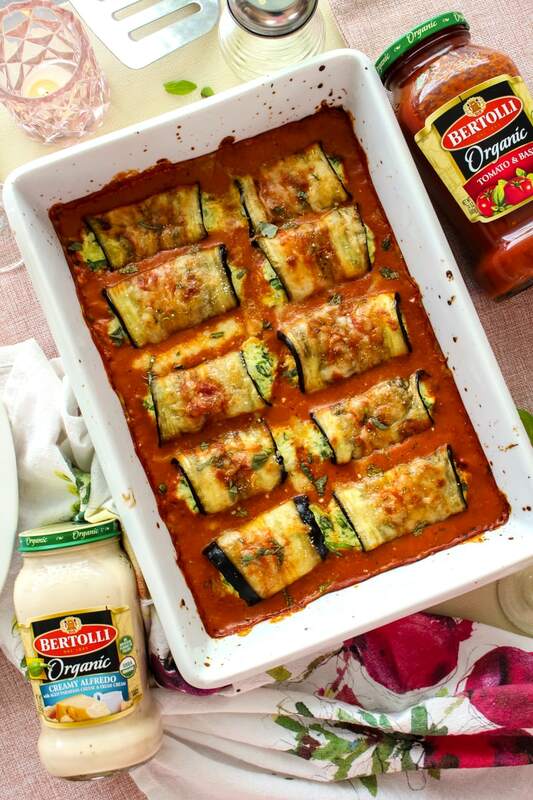 I know that you, and whoever you share it with, will love the combination of Bertolli® Sauces as much as I do! If you do decide to try this recipe, I’d love to know what you think in the comments below. Enjoy! 1. Cut the ends off of the eggplant. Slice into 1/4-inch slices to make around 10 slices of eggplant. Arrange sliced eggplant on paper towels. Sprinkle both sides with salt and let sit for 15 minutes. 2. Preheat your oven to 400 degrees F. Rinse the salt from eggplant and pat dry with paper towels. Arrange the eggplant slices on a parchment-lined baking sheet. Brush the slices with olive oil on both sides. Bake the eggplant in the preheated oven for 10 minutes. 3. Meanwhile, in a large bowl, combine the ricotta cheese, egg, 1/2 cup of the mozzarella cheese, chopped spinach, pecorino romano cheese, Italian seasoning, and garlic powder. 4. In another large bowl, combine the Bertolli® Organic Traditional Tomato & Basil Sauce and the Bertolli® Organic Creamy Alfredo Sauce to make the Rosa sauce. Spoon 2 cups of the Rosa sauce into the bottom of a large baking dish. 5. To prepare the rollatini, place a heaping spoonful the ricotta mixture onto the thinner end of each slice of eggplant. Roll the eggplant around the cheese mixture. Repeat with the remaining eggplant. Place the rollatinis into the prepared baking dish. 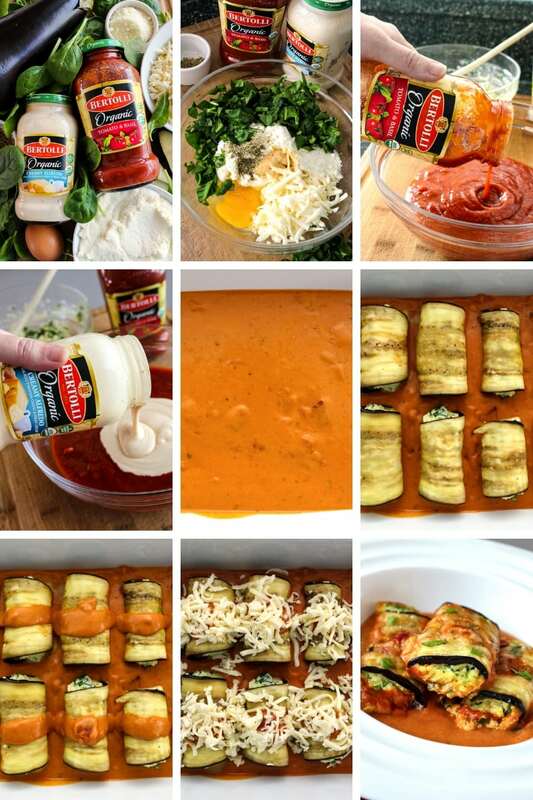 Spoon additional sauce over each rollatini and sprinkle with the remaining mozzarella cheese. 6. Bake in the preheated oven for 30 minutes. As is, this is a meatless recipe. If you would like to add meat to the ricotta cheese filling, some browned Italian sausage would be a great choice.